My little Cougar turned 1 last month. I wanted to remember what my favorite baby things were before I forget the details of this stage altogether. I do not get any commission on these items, except if you decided to buy Shaklee’s Basic H. These are just my favorites baby things! Ubbi Steel Diaper Pail – I like this one because it is easy to open and close. Also, I get to use regular kitchen garbage bags. As long as it stays closed, it does a pretty good job at keeping the smell contained! 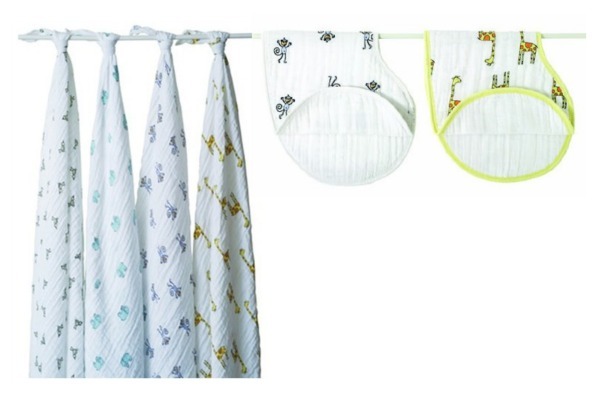 Aden + Anais Muslin Favorites – I love all of my Aden + Anais baby things, but my favorites are the swaddling blankets and burpy bibs. I mean, amazing!!! My burly bibs were my absolute favorite burp cloths that double as bibs. I only had two and tried my hardest to always keep a clean one. Baby’s First Play Things – I strategically place these things around the house, so that baby can be content and life can go on. I kept one in my bathroom so I can shower and get dressed! (Obviously shower quickly. Ha! Babies don’t last a super long time in anything.) I keep one near the kitchen so I can still prepare meals for everyone else! And then I would move one around with me as I needed to do things like laundry or some house cleaning. Baby Food Pouches and Spoon Attachments – When baby is the youngest of four, chances are mealtimes might happen at a school assembly or while grocery shopping or church or any random place. These pouches and spoons made it so easy to feed baby anywhere, and with practically no mess. Diaper Bag & Stroller Clips & Caddy Stroller Frame – My opinion is you should get a diaper bag you love, because for at least 1 year of your life, that diaper bag will go everywhere with you! I loved my stroller clips that coordinated with my bag, because it easily clipped on and off the stroller. And, please, do yourself a favor and get a stroller frame/ carseat caddy for the first year! It was so light and easy to use. The carseat plopped on and locked into place so easily. So, so easily. Sound Machine – Every Nursery needs a good sound machine! It helps when you don’t have to walk around on egg shells near where the baby is sleeping. Well, these are my favorites!! 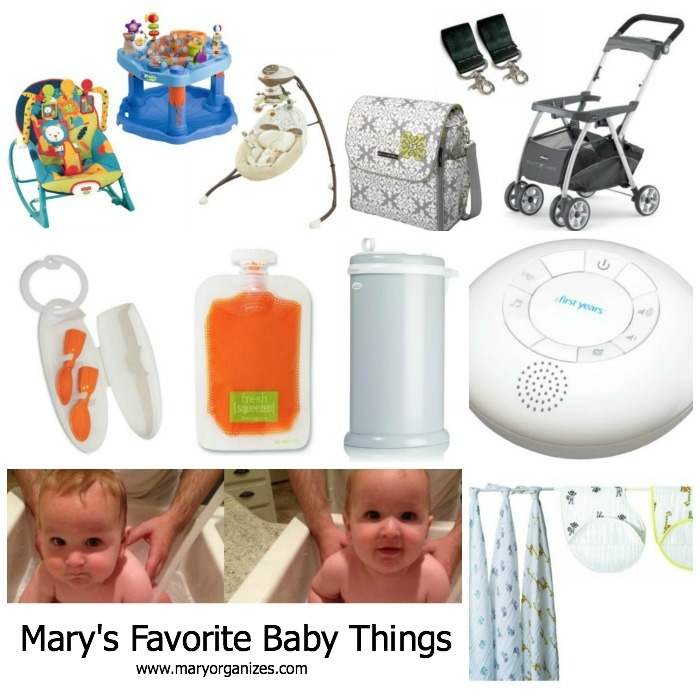 What are your favorite baby things? 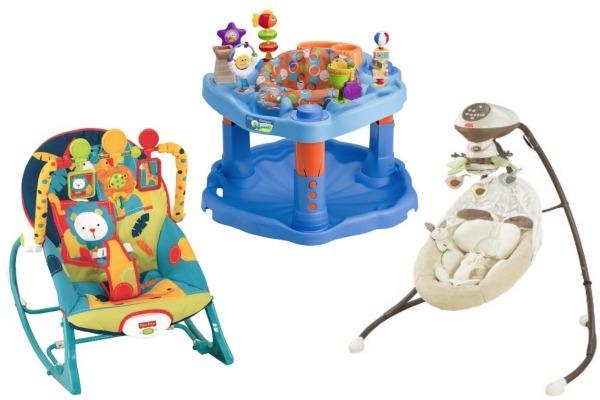 I used all the same baby playthings, placed the same way around my home when our Jackson was small. It really helped life go on, as you say! Isn’t it kind of sad that life has to go on? But since it must, it is good to figure out some things. I think I’ll need some tips to survive these toddler years, though! Now how do I cook dinner when he is getting into everything? !